We know that the carbon dioxide emitted by the burning of fossil fuels acts as a greenhouse gas that warms the atmosphere. Cheap oil during the twentieth century has made cheap food available so that the growth of human population exploded, from 2 billion in 1930 to 7 billion in 2012. But now fossil fuels are harder to extract and more costly. Thus one of the challenges we face is how to raise food with only minimal or no fossil fuel inputs at a time when demand for food is at an all-time high. Burning the remaining fossil fuels will eventually have to be curtailed to reduce the damage of climate change. Despite these grim considerations, there is much that can be done to cope with a damaged climate, and surely more will be discovered as food shortages make us think more seriously about food. CAN FOOD BE GROWN WITHOUT FOSSIL FUELS? Fossil fuels were not used directly in food production until the past century, so it is likely that we could do without them in the future. The industrial system that now produces our food needs a great deal of energy to do so, about ten calories of energy to produce one calorie of food. According to Sara Scherr, food and fiber production are leading sources of greenhouse gas, greater than the transportation sector. The industrial food system grew largely because of cheap energy. It has nearly replaced household food production, but, as we have already seen, its profligate use of energy is threatening the stability of our climate. It is not sustainable without those massive energy inputs for fertilizer, mechanization, transportation, and processing of raw materials into manufactured food products. As the food we buy continues to rise in price , more and more people will want to raise some of their food. And with high rates of unemployment, many people have time to do so. This shift can gradually replace parts of the energy-intensive corporate system. Since energy-efficient and ecological farms will increase, local stores will more and more sell their produce and the surplus that selfprovisioning growers can offer. Although the transformation of the food system is a gradual process, it is part of the movement toward a post-carbon future that will be very different from how we live now. A great majority of the people, even in what were industrial societies, will be involved in food production in contrast to the few that are now farmers. As intelligent human labor gradually replaces the brute power of fossil fueled machines, a new society will emerge with new values and, hopefully, a deeper sense of earth-centered spirituality. People who begin gardening, as they live from season to season and participate in the cycles of nature, recognize that raising food has changed their consciousness. It is also possible that as climate change becomes more noticeable and inconvenient, other voices will urge various geoengineering projects to “save the earth.” This is a typical response from the industrial mindset, and of course it would make money for some. But a more ecological response is first to reduce the burning of fossil fuels with more efficiency and conservation, and replace fossil fuels with renewable sources of energy. Second, we can sequester carbon dioxide in the soil while raising food. That this is possible and feasible without great cost or difficulty is the really good news in this paper. We can expect that climate change is not a static condition but an ever-changing process. As the global atmosphere continues to warm and glaciers continue to melt and oceans rise, new problems will emerge. At this time we can count on droughts in some areas, such as the Great Plains, and flooding in other areas, along with more violent storms. Warmer winters will allow more insect pests to survive and do more damage. Continuing loss of biodiversity will upset the balance of nature. We as Americans can try to adapt to these conditions, and as the momentum of climate change continues, we can continue to adapt once we have begun. Bill Mckibben warned that a warmer climate itself can reduce crop yields by at least 10%, and drought will impose even higher losses. We may have less to eat. Trickle irrigation, which minimizes the waste of water, may be helpful in areas where groundwater is available. The remainder of this paper is focused mainly on what small communities can do to slow climate change while raising food. This should not imply that small-scale farmers and gardeners can simply retreat to their gardens and ignore the larger society. Many agricultural policies are in need of the lobbying that citizens can do to push for changes. Ending the disastrous subsidy for ethanol production is one example. Other policies, such as the facilitation of land redistribution, can help to make the transformation to a post-carbon food system possible. Meanwhile, we can expect that industrial modes of farming will also continue for some time, powered by the remaining fossil fuel or by bio-diesel. As a small-scale organic farmer and gardener who has worked with other organic growers to promote organic food and farming in Michigan since 1973, I am glad to report that the writers who worry about climate change continue to recognize the value of organic methods. Although this “new” postcarbon organic food production will include some significant differences from traditional methods, it is still organic insofar as it rejects the use of petrochemical substances for fertilizer and pest control. It also works to feed the organisms in the soil rather than following the recommendations for nitrogen, phosphorus and potassium to feed the plant. Adding organic matter to the soil also helps to sequester carbon in the soil. Sara Scherr explained that ending dependence on anhydrous ammonia is especially important in reducing greenhouse gases, since it emits nitrous oxide, which, as the third major greenhouse gas, has about 300 times the warming capacity of carbon dioxide. Organic growers often depend on compost, green manure, legumes, blood meal, and livestock manure, on wood ashes and on bonemeal to help the organisms in the soil make plant nutrients available. This new organic growing differs from some older organic methods in that it urges the need for reduced tillage or no-till production. Turning and exposing the soil allows carbon in the soil to oxidize and escape into the atmosphere. Albert Bates and Toby Hemenway report that “long term research studies reveal average losses of 328 pounds of organic matter per acre per year with plowing, whereas no-till studies report an average increase of 956 pounds of organic matter per acre per year”. It is important to recognize that carbon is stored in this organic matter and that its conservation enhances soil productivity. Although no-till drills and planters can be used in large fields, the use of mulch is an effective method on the garden scale to control weeds and conserve moisture. Most books on gardening extol the virtue of mulch and explain what to use for mulch and how to use it. Two other strategies may be of great value in sequestering carbon in ways that help in the growing of food crops: planting trees and making and incorporating biochar into the soil. Perennial woody plants not only store carbon in their root systems, they can improve the soil and help with water retention in hot climates. Mark Hertsgaard was so impressed with how trees helped food production in Mali in a program called “farmer managed natural regeneration” (FMNR) that he called it “the largest environmental transformation in Africa”. As we anticipate more heat and drought in our grain raising area, lessons from Africa may help us cope. And, since deforestation is another major cause of climate change, planting trees is especially important. Trees can also sequester more carbon than gardening based on tillage. The importance of planting more trees raises the question of whether there is enough land to do this. The answer is that we do, at least in this country. Douglas Tallamy has pointed out that millions of suburbanites and rural residents maintain almost 40 million acres of land in lawns. This could be gradually converted to deep-rooted perennials, or permaculture, and thereby help to raise food while also sequestering carbon with perennials. Still another way to raise crops while conserving organic matter in the soil and avoiding tillage is to grow some of the perennial grains that are being developed at places like the Land Institute by Wes Jackson and his associates. The root systems of perennials are much greater than annual grains, and while the yield is smaller the protein content is sometimes about the same. Another advantage of perennial grains for small-scale growers is that harvesting the grain could be done by hand. Biochar is a fairly recent emphasis in relation to climate although it may have been made in the Amazon forest thousands of years ago where patches of black earth, terra preta, have been found and continue to remain fertile in areas of otherwise thin acidic and infertile soil. In the past biochar has been made and used mostly by small-scale growers, and some writers think it should remain that way because they fear that its commercialization might do more harm than good if its development were not regulated. Corporate interests might be tempted to plant and harvest trees for biochar production, so that it could become another form of geoengineering, though more benign than some. Industrial applications of biochar production already exist, and they work best when they are set up in connection with a steady supply of biomass, such as chicken litter from a large poultry operation. Biochar, like charcoal, is made by burning some kind of biomass, often wood, in a low oxygen environment. This method of pyrolysis is often achieved with specially designed stoves, some of which are described and evaluated by Albert Bates. John Bruges, another critical advocate of biochar, suggests that farmers and gardeners may need help from an extension service and a fee for carbon sequesterization, a “carbon maintenance fee”, to help them get started. Once the growers see that biochar can increase yields they would be inclined to continue using biochar. The potential for biochar to sequester carbon is great. Mark Hertsgaard reports that “according to Johannes Lehmann, a professor of agricultural science at Cornell University and one of the world’s foremost experts on biochar, if biochar were added to 10 % of global cropland, . . . it would store 29 billion tons of carbon dioxide equivalent, roughly equal to humanity’s annual greenhouse gas emissions”. According to writers on raising food in a changing climate, livestock can continue to play a role in food production. Livestock can utilize land that is not fit for raising crops, and some animals, such as chickens and pigs, can thrive on waste from household and garden. The amount of grain that is needed can be greatly reduced for many animals, and cattle can grow and produce milk on grass without grain. Rotational grazing, where cattle are grazed intensively in a small area and then moved to another small area, can actually improve pastures when the grass is given a chance to recover. This also conserves carbon in the soil, especially when the grasses are perennials with deep root systems. CAN WE EXPECT A TRANSFORMATION OF CONSCIOUSNESS? If climate change can be slowed it may be possible that food could be grown to feed most of the people alive in 2100. But many questions remain and more will emerge. Will there be enough water to irrigate crops in droughty times? Can insect pests be controlled as the climate changes and more exotic pest varieties emerge? Will loss of biodiversity threaten ecosystems? Can the nations of the world avoid war over scarce resources? Will a modicum of social order prevail within societies? Will people be willing to work together for the good of the community and the earth? Any one of these issues could destroy the social order. There is no hope for humanity without the healing of people infected by the industrial/ commercial disease of selfish money grubbing. But this is possible. We do need to keep in mind that the dominant cultural characteristics that shape people’s attitudes in a given age are not necessarily universal or given by human nature. So we will need some sort of transformation. Many New Age writers have written about, and expect, a spiritual transformation. Anything is possible, of course, but we can imagine a transformation that is not only possible but probable in terms of social dynamics and not dependent on supernatural intervention. As people live through the very difficult transition from a life which is still easy even now at the end of the industrial age, to a much more difficult life of hard work with far fewer energy slaves, they will remember. They will remember that they are living in the ruins of the twentieth century with its extravagant use of energy. They will remember that their suffering was caused by a culture that sought an easy life through fossil-fueled technology. They may recognize that they have moved beyond the Age of Separation into an Age of Reunion in which they are able to work together for the good of the community and the earth, as Charles Eisenstein predicted. When communities succeed in raising food and surviving against enormous odds, they regain the hope that life is possible. The challenge of adapting to a changing climate will require and absorb all social and mental energy. 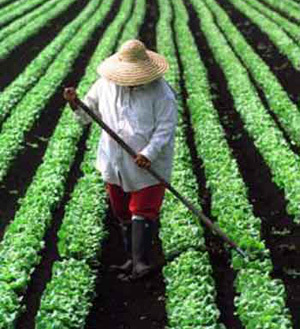 As more and more people work at raising food, food becomes a central, and centering, activity in their lives. New ways of thinking about nature become normative. Raising food helps people relate to nature as the dominant power in their lives. They recognize they do not control nature but are dependent on it. They participate in natural cycles, living from season to season, and gradually forget the noxious myth of progress in linear time through technology. Thus food provides grounding for the desired transformation of consciousness. Hertsgaard, Mark, Hot. (Boston: Houghton Mifflin Harcourt, 2011). Lehmann, Johannes, and Stephen Joseph, Biochar for Environmental Management. (London: Earthscan, 2009). McKibben, Bill, Eaarth. (Henry Holt Times Books, 2010). Scherr, Sara, and Sajal Sthapit, “Farming and Land Use to Cool the Planet,” in State of the World, 2009 (Washington, DC: Worldwatch Institute, 2009).